Mildred’s life began on February 6, 1926 in Chaonia, MO. She is the daughter of William G. and Maude K. (Classick) Cooper. Mildred was a 1944 graduate of Eureka High School, going onto earn her degree in education at Emporia State Teacher’s College and her Masters of Education degree from Wichita State University. She began her career in education at the Butler County #8 School for five years before teaching in El Dorado 5th grade at Washington Elementary and later 7th grade English at El Dorado Junior High School, retiring after 34 years in education. Mildred was united in marriage to Harold “Sarge” Waltman on May 15, 1946 in El Dorado. Mildred was a member of the First Baptist Church in El Dorado, Kansas Teachers Association and enjoyed her coffee time with fellow retired teachers. Her greatest joy was her family which includes her daughter Margie (Tony) DiVirgilio of Broomfield, CO; daughter in law Carol Waltman of Andover; grandchildren John A. (Robyn) DiVirgilio of Broomfield, CO, Ann (Suzette) DiVirgilio of Santa Cruz, NM, Jeffrey (Kim) Waltman of Wichita and Jennifer Guardiola of Andover; great grandchildren Haley, Owen, Chloe, and Hunter DiVirgilio, Kinley and Reed Allen Waltman, and Alex and Avery Guardiola; sister Marge Campbell, brother in law Perry Waltman of Newton and sister in law Marie Waltman of El Dorado, her adopted daughter Susan Ellis of El Dorado and a host of beloved nieces, nephews and other relatives. 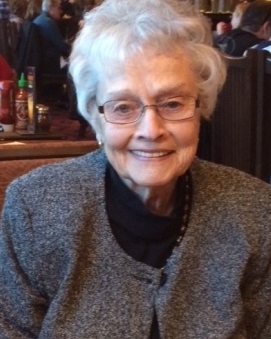 Mildred passed away at the Collier Hospice in Wheat Ridge, CO. on September 12, 2018. She is preceded in death by her parents, husband Sarge in 1965, son Richard Waltman and six siblings. Her family will gather with friends on Tuesday at 11 a.m. at the Carlson Colonial Funeral Home. Mildred will be laid to rest in Sunset Lawns Cemetery. Memorial contributions in her name may be directed to KPTS Public Television for Wichita. Please sign her online guestbook and leave a memory of Mildred at www.carlsoncolonial.com.